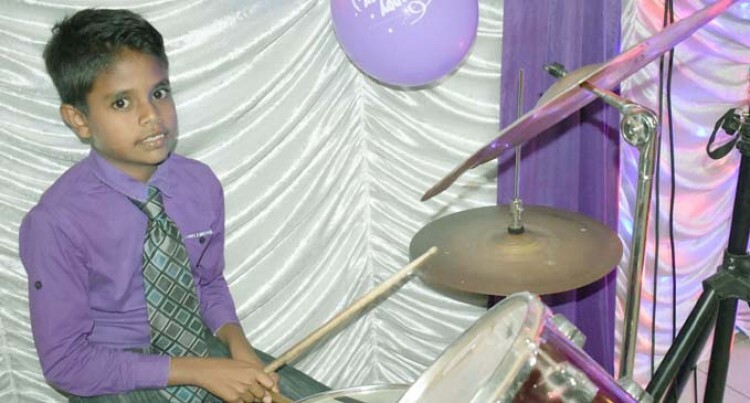 Samuel Pillay was only eight-years-old when he started playing drums at Tuatua Christian Fellowship Church in Labasa back in 2015. He never received special training or tution in playing the drums before. Whenever his father, Shalendra Pillay who is the pastor of the church attended the mu­sic practice on Saturdays, Samuel would tag along. “I would always stand beside the drummer during breaks to see how he used the stick to make beats to the music,” Samuel said. “Whenever my hands were free I would pick up pencils, spoons, broom sticks or pen to make music. “One day the drummer who is a nurse by profession didn’t come for church worship service due to work commitments. I ap­proached my father if he could grant me the permission to play the drum to which he agreed,” the 10-year-old of Tuatua said. “I sat on the seat and looked outside the church to see the plants, flowers and trees. “After I prayed on my knees, I played the drum and everyone was so surprised. “I didn’t realise that I could play well be­cause I never practiced using the actual stick on the drums,” he said. “Since, then I have been playing drum and whenever I play drum I look outside instead of looking at my hands. “This is because as soon as I play the drum to make music, I see the motionless trees and plants swing with the aid of the wind. When questioned why he had interest in playing drum, the youngest of three siblings said he likes making beats to the music. His mother, Shaleshni Pillay, said she of­ten received complaints from Samuel’s Year Four teacher. “The teacher told me that Samuel makes lot of noise in the classroom,” Mrs Pillay re­vealed. “When questioned what kind of noise, the teacher replied, Samuel uses pencil to hit the desk so that he can make a special rhythm. When Fiji Sun Aspire asked Samuel what he wish to become in future, he said his fa­ther was his role model and thus he wants to become a pastor. “I want to be my father’s right hand; help­ing him serve God’s people,” Samuel said. His father said he was very proud of Sam­uel. “I feel happy to see my son lending a help­ing hand,” Mr Pillay said. “As parents we encourage our children to do good and never sit idle.